Service stations.. | Through the seasons before us..
Service stations, those bittersweet offerings of facilities and energising treats at ludicrous prices! Just leaving one on the M5 which has been over run by travelling Trickies. This is always promising; a healthy following is always desirable, even if the queues for sandwiches and coffee are rather dramatically enhanced by red shirted hordes. The mood is very positive amongst the travelling faithful, which reassures me. Given our departure time, I still can’t quite work out just what time we are expecting to arrive at The Liberty Stadium, but well, roll on the four hours ‘tip kick off! 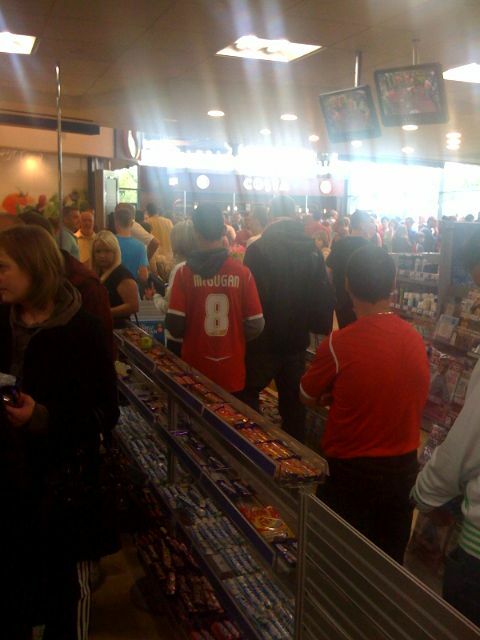 Not the clearest image in the world of Forest fans swarming around a service station! I remmber being at a service station in Wales when West Ham and Palace were contesting the play off final, over run with londoners it was!